Support for the Adafruit Feather M0. Feather M0 boards are development boards shipped by Adafruit. 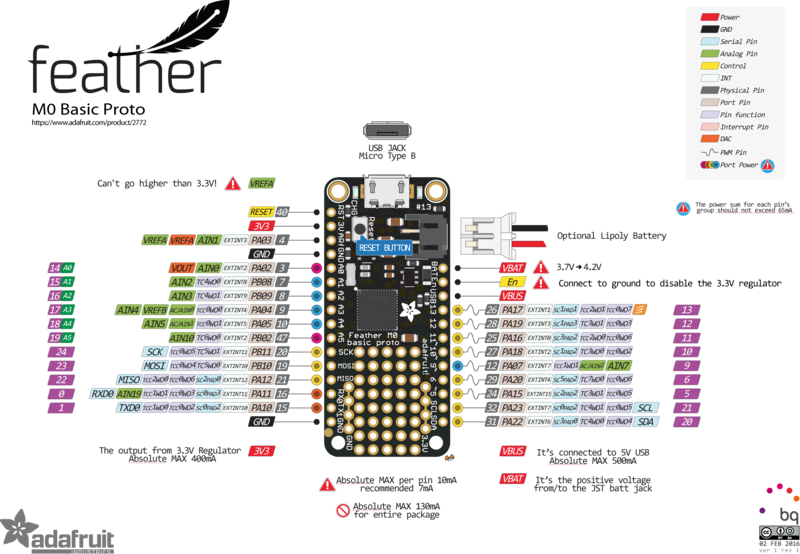 All the feather M0 boards are built based on the same Atmel SAMD21G18A microcontroller. See Atmel SAMD21. The different modules used to differenciate the boards (ATWINC1500 WiFi, Bluefruit LE, SD card, LoRa) are connected via SPI (SPI_DEV(0)) to the SAMD21 mcu. When the board is in bootloader mode, the user led (red) oscillates smoothly. Use BOARD=feather-m0 with the make command. To access the STDIO of RIOT, a FTDI to USB converted needs to be plugged to the RX/TX pins on the board. Board specific configuration for the Adafruit Feather M0. Configuration of CPU peripherals for Adafruit Feather M0. SD card configuration for the Adafruit Feather M0 Adalogger.